From AN OUTLINE HISTORY of Tioga and Bradford Counties in Pennsylvania, Chemung, Steuben, Tioga, Tompkins and Schuyler in New York by TOWNSHIPS, VILLAGES, BORO'S AND CITIES"
In 1792, when Benjamin and Robert Patterson were conducting the German and English settlers to the Pultney estate, where Bath, in Steuben County, is now located, they tarried for some days near where the present bridge across the Tioga River in the southern portion of the borough of Blossburg is now located. They erected a huge oven and cleared away the timber, and made a "camp" which was afterwards known as "Peter’s Camp." In the year 1806, Aaron Bloss located upon this camp, and erected a dwelling, which was for many years was used as an Inn. 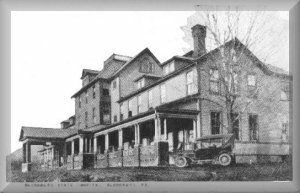 His nearest neighbor to the southward was ten miles away; his Inn was located however upon the Williamson road, which then was the only road been Williamsport on the west branch of the Susquehanna, and Painted Post at the mouth of the Conhocton River. The coal which had been pronounced good by the English who accompanied the Patterson brothers, soon began to attract attention. In the meantime, David Clemmons had located two and one half miles to the northward upon the banks of the Tioga river, and purchased several warrants of land. He also opened up the coal where years afterwards the Arbon Coal Company first commenced operations. Among the early settlers within the present limits of Blossburg Borough were; Absolom Kingsbury, Isaac Walker, Ashael Walker, Royal Walker, Judge John H. Knapp, D. P. Freeman, Lewis Saynisch and Samuel Weeks, when the construction of a railroad from Blossburg to Corning, or soon thereafter Col. Joseph Yonkin, Alexander H. Gaylord, John L. Evans, James H. Gulick, Francis Welch, John James, Thomas Turner, a brother-in-law of Hon. Erastus Corning, William Butler, Clarendon Rathbone, Franklin R. Smith, John G. Boyd, P. P. Cleaver came on and located. Hon. Horatio Seymour in 1837 visited Blossburg, and in company with Hon. Amos P. Granger and Hon. Thomas P. Davis of New York and Curtis Parkhurst and Hon James Ford of Lawrenceville, Pa., purchased lands and sold lots within the present borough limits. When the railroad was completed in 1840, from Blossburg, another large installment of settlers came. The first store, saw mill and furnace were erected by Judge John H. Knapp, as early as 1826. It was claimed by Miller Fox, the chief engineer of the Corning and Blossburg R.R., that the time would come when one hundred thousand tons of coal would pass over the railroad, his statements then were ridiculed. A million tons annually now go over the railroad, and are marketed. There were some, however, who believed in his prophecies and govern themselves accordingly. The consumption of bituminous coal at that time was very limited, and but comparatively few were acquainted with its use, only as a substitute for charcoal to a limited extent in blacksmithing. The era of steam had not fully arrived. The prosperity of Blossburg depended largely upon the coal trade, which was fickle and unstable. The Arbon Coal Company was succeeded by William M. Mallory, and he by Duncan S. Magee. The transferring of the mining operations of the Magees’ from Blossburg to Fall Brook in the year 1859-60-61, was a great blow to the prosperity of Blossburg. In 1862 there were from forty to fifty vacant dwellings in Blossburg, the town was nearly deserted. The establishment of the Tioga railroad shops at this point at that time revived business materially, and Blossburg again entered upon a new lease of prosperity. In the year 1847, William Design, of Geneva, New York, erected a window glass manufactory in the northern portion of Blossburg, built a store and ten or twelve dwellings. This manufactory was conducted by Mr. Dezang several years, and subsequently by James H. Gulick and O. F. Taylor, and in the year 1867 it was leased by Messrs. Hirsch, Ely & Co., and conducted up to the present by that firm under the co-operative plan. Blossburg was incorporated as a borough in August, 1871. It now contains an Episcopal, Methodist, Baptist, Welch Congregationalist, Irish Catholic and Polish Catholic Churches. A fine graded school, employing one principal and six assistant teachers, a bank, printing and news paper office (Blossburg Register) a window glass manufactory, two saw mills, a planing mill and feed mill, a very large tannery, a foundry and machine shop; the shops of the Tioga R.R., three boot and shoe stores, with shops attached, one shoe making and repair shop, one harness shop, two blacksmith shops, one wagon shop, two paint shops, four licensed hotels, a city hall with rooms for the fire companies, the council and burgess, school board, high constable, election board and for a prison or lock-up, five eating saloons, two billiard rooms, three furniture and two undertaking shops, two wholesale liquor stores and bottling establishments, four clothing stores, three dry goods stores, three general merchandise stores, a tea and coffee store, two hardware stores, several grocery stores, a photograph gallery, an express office, a depot, band room, three music teachers with rooms, two dentists, eight physicians, four drug stores, two lawyers, two meat markets, a brass band, Masonic Odd Fellows, Knights of Honor, and Rebecca Lodges, a skating rink, a public hall and about three thousand inhabitants. There are two branches of the Tioga railroad and one of the Corning and Cowanesque railroad, leading southward and eastward. The Arnot branch of the Tioga railroad to Hoytville and Morris Run, and the Fall Brook branch of Corning, Cowanesque and Antrim to Fall Brook. Blossburg is one of the most desirable locations for manufacturing in the county. M. E. Church organized in 1867. Polish Catholic church erected in 1867. St. Luke Episcopal church organized in 1867. Arbon Lodge I.O.O.F., organized May 20, 1853. I.O.O.F. Encampment organized April 13, 1867. The 12th Regiment band organized in August 1873. Bloss Lodge A.Y. Masons organized March 9, 1867. In 1865 the Presbyterian Church purchased by the Baptist. Catholic Temperance Association organized August 16, 1874. Martin Stratton has been a resident of Blossburg for over forty years. Col. Joseph Yonkin has resided continuously in Blossburg since 1836. Blossburg has two fire companies and is about to purchase a steamer. March 6, 1873, the entire business portion of Blossburg destroyed by fire. Christ Church organized 18th of Jan, 1842, no edifice was ever erected. Blossburg Register established in 1871, by Harry and Frederic L. Graves. Faith Degree Lodge, Daughters of Rebecca organized October 20, 1874. Mr. Zion Church (Welsh) organized in 1840, erected fine church in 1870. Presbyterian Church organized in 1853. James H. Gulick and Hon. Horatio Seymour, prominent contributors. Thomas Morgan, an old settler of Blossburg, who died a few years since had been an Odd Fellow for fifty-three years. Martin G. Lewis has for several years been chief of the Blossburg fire department. The Lewis fire guard were named in his honor. Francis Welch, Esq., who died a few weeks since, at an advanced age, came to Blossburg in 1837, and for nearly thirty consecutive years was acting justice of the peace. Blossburg Industrial Register established by John L. Sexton, Jr., May 20, 1879, continued two years, when Mr. Sexton retired and the paper was named "Blossburg Register" now owned by F. L. Graves and Charles Ely. St. Andrews Catholic Church organized in 1841, with twenty members, Rev. Joseph O’Reilly of St. Joseph Church, Susquehanna Co., Pa., first officiating. Coffin Calket, of Philadelphia and Hon. Horatio Seymour contributed.